Boukreev’s quote has resonated with me ever since I read it. The mountains provide me a solace that I cannot find anywhere else, and it is not the accomplishment of reaching a summit that fulfills me. It is simply the act of moving through the mountains that brings my life balance. With five weeks separating us from our last outdoor adventure, my religion began to feel neglected. It was time to trade in the ceaseless buzz of the urban grid for the calming rhythm of shoes pounding dirt, the claustrophobic confines of a cubicle for the open vistas above treeline, and the ambiguous progress of office work for the rewarding simplicity of reaching a summit with nowhere left to ascend. It was time to go back to the mountains. Our destination for the day was the Vivian Creek trail up Mount San Gorgonio. San Gorgonio is the highest peak in Southern California at 11500 feet, and the Vivian Creek trail is shortest way up to the top. It also covers more elevation gain than most of the routes up the mountain. In other words, it is pretty steep! Don’t worry though, there are no crazy sections like the North Backbone Trail up Mount Baldy, it is just a very steady climb from start to finish. We arrived at the parking lot at 7AM on a Sunday morning and were greeted by a ranger at the gate. The gate at Vivian Creek is a new installment from this summer, and it brings in some additional red tape to trail. The difference is that the trail now had limited hours of access; specifically, from 6AM to 10PM daily. If you like to get an early start, or head back to your car late in the summer, you might need to start changing your plans. Additionally, the ranger will ask you for a permit, so make sure you have one. Unlike most areas, the San Gorgonio Wilderness requires that day hikers carry permits as well as overnight hikers. Permits can be reserved in advance via fax, and there are also limited self issue permits available at the kiosk at the Mill Creek Ranger Station. The first part of the Vivian Creek trail goes along a gravel access road alongside the Mill Creek canyon. After about a third of a mile, the trail then crosses the creek. There are signs warning about crossing the creek in a flash flood, and I don’t doubt the danger. Make sure you have a plan B if you are hiking here when a downpour occurs in the area. For us, it was bone dry. After the crossing, the trail heads up the hill on the opposite side of the creek via a series of switchbacks. This is one of the steepest sections of the trail as the switchbacks carve up the mountain at an aggressive angle. If this doesn’t get your heart pumping, then you are in much better shape than I am. Not that that is saying much. Pretty soon the trail reaches high enough to get a view of the lower canyon and the Inland Empire. Mount Baldy and the San Gabriel Mountains are clearly visible in the background. Don’t take these open views for granted, they are surprisingly rare on this trail for the first 5 miles. 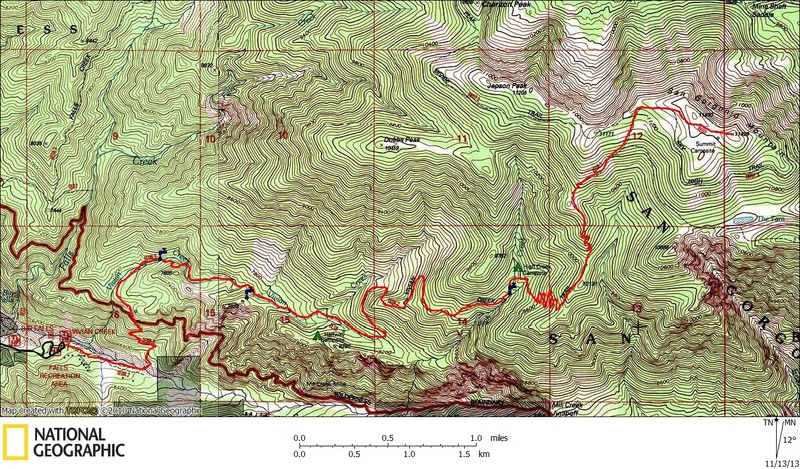 Once at the top of the switchbacks, the trail enters the San Gorgonio Wilderness and begins to follow Vivian Creek up a canyon. This is one of the places on the trail where you can tank up on water, although on our visit it was barely a trickle. In other trip reports that I read while researching this hike, some people refer to the Vivian Creek area as a lush canyon that provides a nice alternative environment to the majority of the trail. Maybe it’s because we were there in the fall during a dry season, but that description of the area seems like a gross exaggeration. For the most part, the trail along Vivian Creek continues to be the familiar looking socal forest that pervades the area. That leads me to my chief complaint about this trail. The views don’t change very much considering the distance and elevation that the trail covers. Trees are constantly flanking the trail, which is useful for sun protection but doesn’t help hikers see much outside of the tunnel they are in. Additionally, the topography of the area means that most of the trail is in side canyons with limited sight lines for the majority of the hike. It is not until the last 1500 feet that things open up as you would expect them to on Socal’s biggest peak. When the views do open up, they do not disappoint. We were fortunate that the nearby north facing slopes still had a dusting of snow on them which added another layer to the beauty. Halfway up the hike, the trail passes High Creek which is the last reliable water source on the way to the summit. The creek was barely a trickle on our visit, but it was enough to refill our bottles and let Callie cool her paws. From there, the trail goes up a hill via another series of switchbacks that meander up the hill at a gradual pace. Once the trail reaches the top of the hill and gains the ridge, the views open up considerably. San Jacinto’s rugged profile emerging straight from the desert floor is an impressive sight. Moving forward, the view of the summit area finally comes into view as the ridge turns a corner. Only 1,700 feet left! Shortly after that, at around 10,200 feet, the trees that had been surrounding the trail thin out very quickly. The summit appears almost within your grasp at this point but it is still over a thousand feet to the top. Without any acclimation time, the altitude was hitting me at this point so we took it slow on the final approach. 11,000 feet can do that to you. The top of the mountain is extremely flat, and it’s hard to initially see where the summit is. Just keep following the trail. Once you see a group of people, you’ve found the summit! Sadly, like many SoCal summits, unless you come here on a non summer weekday then you are unlikely to have it to yourself. Since the summit is flat, the views are actually pretty underwhelming compared to what you get on some of the sections of trail leading to it. It reminded me of Mount Baldy in this respect. The best views were looking north towards the rest of the Gorgonio Wilderness. I can’t wait to explore this area some more! We didn’t linger at the summit for very long. It being fall, we were already running out of daylight so we scurried back down the trail. Starting out on the return, the view towards Los Angeles spanning all the way to the ocean is gorgeous. The city is so far away that it seems like another world, and yet we had just come from there a few hours earlier. The fact that we were 10,000 feet lower in elevation only 9 hours previously was pretty remarkable, and a testament to the fact that Los Angeles provides an under appreciated opportunity for adventure. As we made our way down the mountain, the afternoon light bathed the mountain in an increasingly orange glow. We were blessed with fortunate timing which allowed us to get a view of Baldy rising above LA at sunset. It was a beautiful sight to end the day with. At this point we were still a couple thousand feet above our car, and night set in pretty quickly. It’s pretty amazing how quickly the forest can transition into night. Within a half hour, it was pitch dark. As always, I was carrying my headlamp and some extra batteries, and Callie had her light beacon as well, so there was no concern. Although, hiking through the woods in pitch black by yourself for over an hour is a little unneverving. We passed by a couple of campsites near Halfway Camp and the solitary headlamp pointing towards me from the black abyss as I walked by spooked me a bit. I should probably watch less horror movies. Fortunately, we made it back to the car sans hillbilly murder and headed back to civilization where I rewarded myself with pizza and Callie rewarded herself with a 12 hour nap. Most of my body ached and all was right with the world again. It looks like you and Callie had a grand day out and about. For future reference she should have been on leash during your hike as San Bernardino county has a leash law. It would put a damper on your day to receive a citation for that kind of infraction. Thanks Frank. I’ve been waiting for someone to bring this up on here, and you are the first. We do carry a leash on all of our hikes but I think it’s asking a lot to have your dog on leash for 12 hours and 11,000 feet of elevation. I understand this is a touchy subject for some people, so I’m not going to go any further for now. I might do a post dedicated to this subject at some point. I’m proud of your dog for being able to do San G as a day hike. Love the post and pix, especially the distant view ones and the sunset one. Always wanted to hike this area. And that’s a lot for a dog to do…well done, Callie! I know what you mean about the repetitive/underwhelming views here in SoCal. The Sierra it ain’t, but at least it isn’t under a couple feet of snow…yet. Well said! Although, we look forward to the snow in the local mountains. We have some fun plans for the upcoming winter. Beautiful pictures! Thanks for the write up! One tough dog. I enjoyed your pics. I think you would be ok from the Falls Parking Area or Vivian Trailhead Parking Area as long as you aren’t stopped by a Forest Service Law Enforcement Officer (LEO). Your Wilderness Permit is not required until the Wilderness Boundary. The Adventure pass is required however when parking within the Falls Recreation Area. The Forest Service volunteers have no authority to ask for permits or detain you in any way. The leash regulation applies in the picnic area and inside the Wilderness. Nice post and great photos! That big tree in the fourth photo looks like a giant sequoia — but not sure. There are (I think) some sequoias near the Mt. Baldy visitor center that someone must have planted way back when.